Babies, a book, and the VW Routan. Brooke Shields has been one busy mama! Shields, who is the mother to daughters Rowan and Grier, published her first children's book earlier this year titled, Welcome to Your World, Baby . Just lately, Volkswagen has featured her as the star of their "Routan Boom" commercials. The ads are unique but don't mention much vehicle specifics. The Volkswagen Routan was created with the family in mind. 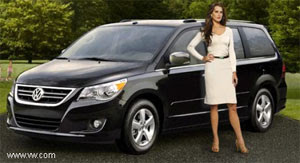 For the features and specs, visit www.vw.com/routan. Want to have a little fun while visiting the website? Use the Babymaker 3000! Upload a picture of a mom and a dad and see the resulting combo-baby. Apparently, the image to the left is what one of my children is supposed to look like according to Babymaker 3000. Not bad, but I think my actual kids are cuter. One other interesting fact: "Routan" is a combination of the English word "route" and the "-an" suffix that is used in the names of Volkswagen's European vans, so it's a literal combo of two engineering worlds, VW and Chrysler. To enter, leave a comment letting me know what you like best about the Volkswagen Routan. • Contest ends on Friday, December 19, 2008 at 11:59 PM CST. I totally love that is has With dual remote-controlled power-sliding doors!!! This is awsome free hands!! I love VW, I have a passat wagon. I just love that it is a volswagen and that it has third row fold in floor seating!! I love that there are 13 cupholders! Love the rear park assist, since I know I've been too distracted to see how close I am to things behind me now and then. Thanks for the chance to enter, my sister just bought a VW and would love this! I like that it can hold seven passengers and it's very sleek and stylish looking. Ilike the fact it's put out by Volkswagon a name I trust. I had a Jetta, so I love VW's. I just love that this vehicle has so much room! I'd love to have remote start! I love the doors that open by remote! I have needed that feature so many times! Not only do I think those commercials are hilarious, but I LOVE that it has 13 (yes, 13!) cupholders. Fantastic! dual power sliding doors is a great feature. Hi Boy could I use a rear park assist! Lots of kiddies in my neighborhood playing outside! I love Volkswagons too. What I would love about the Routan is heated seats! I like the power sunroof feature the best. I especially like the unique styling of the front of the vehicle.